Acting on a proposal from industry, a project was initiated to transfer the twin trawl technology from Europe and incorporate the results into the Caraquet School of Fisheries Responsible Fishing Program. The main rationale was that more efficient shrimp production would result in shorter sea trips and better quality catches. A reduction in the number of sea days would have an economic impact by reducing fuel costs and lowering general operating expenses. Twin trawling also provided an excellent methodology for the testing of selective gears and devices. With the shrimp fleet on strict quotas there was no possibility of increasing total production. Grids are mandatory in all shrimp trawls so by catch levels were not increased. A typical Gulf of St. Lawrence midshore shrimp vessel, the "Neomi Karen" from Caraquet, New Brunswick, was selected and equipped for the trials. The project was conducted over a two week interval. Fishing areas were 8 miles south of South Point, Anticosti Island in 4Ss, and 30 miles east of Anticosti Island in 4Sx. Shrimp fishing was poor with the fleet in both areas during the project period. Sea trials were conducted on commercial shrimp grounds in average depths of 165 fathoms, bottom conditions were mainly soft mud. Several concentrations of redfish were observed on the echo sounder and were screened out by the grids. Each of the twin trawls was constructed 24% smaller than the "Noemi Karen" single trawl. Bridles were 25 fathoms and the centre weight, or clump, weighed 454 kg (1000 lb). The vessel,s existing doors were used. These were Bison #11++ with all ballast weights removed. From the towing speed of the vessel,s single trawl, an increase of 100 to 200 RPM was required to tow the twin rig. Utilizing a unique monitoring system, with two electronic gear monitoring systems in parallel, and the complete range of electronic sensors, it was possible to determine the correct fishing parameters in just ten tows. Having established the correct gear geometry, acoustic tension recordings were then obtained from strategic points throughout the gear. Checks were made on the equality of the fishing capacity of both trawls. Fourteen valid tows were surveyed from each trawl, and the weight difference in total shrimp catches was 0.01%. In comparison with the vessel,s single trawl, by using the twin trawl method the Swept Volume increased from 106 sq. m. (1,143 sq. ft.) to 193 sq. m (2,081 sq. ft.), an increase of 82% (see figure 3). Swept Area increased from 1,739 sq. m (18,720 sq. ft.) to 2,067 sq. m (22,260 sq. ft.), an increase of 19%. Unlike European twin trawls, where net openings are normally 10 to 12 feet high, the project trawls consistently showed heights of 24 to 25 feet. More combined trawl width and height were achieved without a proportional increase in drag. Due to the restricted time frame allotted to complete the selected project objectives, direct fuel measurements were deferred until 1997. However, information supplied by the captain on fuel consumption on both single and twin trawling operations during the same fishing period in the previous year suggests that, with all things considered, in a twin trawling operation there was a reduction of at least 40% in fuel costs for the equivalent shrimp catches. This result is presented as a qualitative analysis of some parameters in fishing effort, which will be confirmed once a statistical analysis is produced. Comparison fishing with other shrimp vessels in the fleet, showed very substantial increases in catching efficiency for the new technique. During the second phase of the project, a shrimp grader grid was placed behind the bycatch grid. Evaluations were made regarding its effectiveness in grading juvenile shrimp from the main catch. To initiate the project a joint investment partnership agreement was made, between the New Brunswick Department of Fisheries and Aquaculture, Fisheries and Oceans Canada, Bertrand Mallet (the vessels Captain), Crimond Enterprises Ltd. and the New Brunswick School of Fisheries, Caraquet. The principal technique of multi-rig trawling is that a greater swept area can be accomplished by increasing the footrope spread, without increasing the twine surface area, as would be the case with a single trawl construction. It is possible to increase the swept area, and the catching potential by a large margin without a corresponding increase in drag and fuel. In the case of the twin trawling project another parameter was achieved, that of a substantial increase in swept volume, due to the trawl design giving an increased combined trawl opening. This fishing method is well suited to experimental selectivity programs due to the ease of comparison possible when towing two trawls simultaneously. Once the basic fishing technology was established, trials were conducted with an experimental shrimp grading system. The processors prefer that trips be no more than 7 days duration, as shrimps tend to be more sensitive to spoilage than other species. It is preferable that they are cooked, peeled and frozen within 2 days of landing. It is a seasonal fishery with much of the machinery being unsuitable for processing other species. Towing multiple trawl rigs is not a new idea. This method of fishing in various forms has been practiced in a number of countries, but has recently been tried and adapted in Europe for the catching of prawns, shrimps, flatfish, and monkfish. Beam trawlers tow two beam trawls from booms or outriggers. Shrimp trawlers in the Southern Hemisphere, when trawling in shallow waters, tow up to four trawls using the same system. European twin trawling does not involve booms or outriggers, and the gear is towed by two or three wires in a more conventional method. The principle involves one vessel towing at least two nets, thus increasing the swept area by a large margin, and offering a significant increase in catches of certain species over conventional single trawl systems. Danish Flume Tank experiments have shown that the towing drag of a certain twin trawl system was 2.6 tons at 1.8 knots, compared with 1.53 tons for the same trawl when used as a single trawl. The drag of the twin system was thus less than twice that of the single trawl. This can be construed as being a more fuel efficient system, especially in terms of comparable swept areas. Due to the restricted time frame allotted to complete the selected project objectives, direct fuel measurements were deferred until the next year. However, information supplied by the captain on fuel consumption on both single and twin trawling operations during the same fishing period the previous year suggests that, with all things considered, in a twin trawling operation there was a reduction of at least 40% in fuel costs for the equivalent shrimp catches. This result is presented as a qualitative analysis of some parameters in fishing effort, which will be confirmed once a statistical analysis is produced. When presented with the twin trawl scenario some people are hesitant to accept the idea that a vessel can increase the twine surface area and still have enough power to tow the extra gear. The tension meter data from the experiment revealed, that the reason is concealed in the centre splits at the front of the clump which accounted for 53.3% of the total drag forces, and the outside warps 23.35% each. This data confirms that the centre splits have the strain of two sets of bridles, which is equivalent to one complete trawl, plus the clump weight. Each of the outer warps have the strain of one set of bridles plus a door, which is approximately half of the centre split load. Using the two wire system it is possible to adapt any groundfish vessel to the twin trawl method of fishing without radical rigging and construction modifications. Most vessels who start fishing with the two wire technique soon invest in a three winch/three wire system. Independent split winches are preferable, as this allows for precision tuning of the gear. Several gear configurations have been tried, but the preferred three wire system requires the vessel to be equipped with a three drum winch arrangement, not normally found on standard trawl winches. This application allows two wires to go directly to the trawl doors, and a third wire to the centre of the gear. Having a separate third wire allows the operator to adjust the crucial length and tension parameters on the centre wire. This is a critical feature of the fishing operation, because the centre wire is only curved in one plane and has nearly twice the tension of the outside door wires which are curved in two planes. To accommodate the third wire another winch drum is required which has the same capacity and power as the existing winches. Existing netdrums may be modified to handle and store two nets simultaneously, or a custom made netdrum must be constructed. Some European vessels have two double netdrums each of which holds two trawls ready for shooting in the event of multiple damage. A few extra deck blocks have to be installed, particularly in the case of the third wire arrangement. Another item that may be necessary is a steel crosspiece from port to starboard gallows to hang the third wire towing block. There has been a considerable increase in the number of European fishermen adopting multi-rig trawling techniques over the past few years. It is only natural that Canadian fishermen should adapt these techniques to a form compatible with conditions in their own operating depths and bottom conditions. To design and construct equipment necessary for shrimp trawling utilizing the fishing technique known as European twin trawling, using the two-warp system. This modified system should not involve major alterations and expense to existing vessels. To increase the swept area of the gear, and also increase the swept volume, which has not had a high priority in twin trawling previously. To determine the optimum rigging of the equipment by using electronic gear monitoring equipment. Deploy an underwater camera to monitor shrimp and gear behaviour and create a video of surface and underwater information relating to the project. To conduct comparative fishing trials with traditional shrimp vessels operating with single trawls. To test and evaluate an experimental grader grid designed to release juvenile shrimp. To demonstrate the efficiency of the twin trawl method in catching shrimp species as opposed to the traditional single trawl method. This feature allows vessels to reduce fishing time and make shorter trips. In turn this will improve quality and reduce time at sea, incurring substantial savings in vessel overheads, machinery, and fishing equipment running costs. Record catch rates, and all relevant data, analyse the results, and compile them in a comprehensive report for industry. Present the results at an industry seminar in Caraquet, New Brunswick. The matching of the gear to the vessel, including the design, construction, and demonstration of the twin trawl method was the responsibility of the project supervisor and Crimond. Scale models of the twin trawls were tested in the Newfoundland Flume Tank based on the design criteria and rigging plan supplied by Crimond Enterprises Limited. The gear was tested under simulated conditions and the captain of the Neomi Karen and the project supervisor attended the tests. When the project vessel was selected, particulars were taken concerning deck layout and available thrust outputs. The project supervisor advised the hydraulic engineers and fabricators on the dimensions, power requirements, and modifications to the vessels netdrum. To verify anticipated fishing gear performance, relevant data was processed in the Crimond computer data base and analysed. Segments of the data included information on trawl and door surface areas, vessel horsepower, propeller diameter and pitch, towing speed, and gear geometry parameters recorded on the Neomi Karen's single trawl operation with Electronic Gear Monitoring Equipment. The final predictions were produced by Crimond on the twin trawls Surface Areas, Door Surface Areas, Bridle Lengths, Clump Weight, and Split Wires configuration. Based on the computer information a decision was made to design two trawls with heavy footgear and a substantial headline height. This meant that drag factors had to be carefully considered when determining the surface area of the twin trawls. Each of the twin trawls was constructed with a twine surface area 24% less than the Neomi Karen's single trawl. The split bridles were 94 fathoms, and to avoid different stretch factors caused by siting new and old wire together, four new 94 fathom lengths were used to connect the clump and the doors to the end of the main warp. Bridle lengths were 20 fathoms and the centre weight, or clump, weighed 454 kg (1000 lb). Fishing gear geometry data was obtained by Crimond using electronic sensing equipment from a successful shrimp vessel, the Jean Collette of Caraquet, New Brunswick. This vessel fished with a Crimond 938 shrimp trawl and Bison #9 trawl doors. This data was replicated during the trials. To achieve this the twin trawl doors were 51% larger in surface area, going from Bison #9 (S.A. 28.5 sq. ft.) single trawl to #11++ (S.A. 43 sq. ft.) twin trawls. It was also necessary to reduce each doors weight by 181 kg (400 lb.). From computer estimates it was determined that the vessels existing trawl doors had the surface area capable of spreading the twin trawls. From the towing speed of the vessels single trawl, an increase of 100 to 200 RPM was required to tow the twin rig, depending on wind and tidal conditions. Twin trawls designed for nephrop and shrimp fishing in Europe tend to have a low headline height (10 to 12 feet for a 450 HP vessel) and long footropes. Experience has shown that the main catch of these species are captured in the central groundgear area of the trawl. Trawls designed by Crimond Enterprises for similar vessel horsepower in the Gulf have a headline height of approximately 24 feet and much shorter footropes. This is because Gulf of St. Lawrence shrimpers have a requirement for a high headline so they can fish at night, North Sea shrimpers do not fish at night. Another difference in the North Sea trawls is that they have light footgear consisting of grass rope with lead weights on the wing sections, and a centre section of 6" and 12" plastic bobbins with 3" rubber discs between them. In contrast the Gulf of St. Lawrence shrimpers use 4" and 5" rubber discs in the wing sections and the centre section has 6 x 16" rubber bobbins. This footgear is designed for heavier duty on harder bottom. The vessels existing netdrum was modified to accommodate two trawls. A centre flange was inserted and both sections of the netdrum ran on a common shaft. No other modifications to the vessel were necessary. Brief the captain and crew on the application of the European twin trawl technology and shooting and hauling techniques. Measure bridles and chains on the wharf and install the fishing gear on the vessel. Sail to selected inshore fishing grounds to conduct gear handling trials. Deal with any problems that may arise during initial hauling and shooting, and familiarize the captain and crew with the new method. Conduct a series of short tows to establish if the gear is fishing correctly. Return to port as required in order to make alterations or adjustments to the gear. Sail for commercial fishing grounds. Undertake normal fishing operations on good ground along with traditional shrimp trawlers to assess the comparative performance of the twin trawl system. Conduct selectivity experiments with a shrimp grading device and evaluate its performance. Log all activities using a PC data base management system and special log sheets provided for the project. Utilize underwater cameras to observe gear and shrimp behaviour. Test and evaluate the geometry of the fishing gear and log data using electronic gear monitoring equipment. Site electronic gear monitoring equipment tension sensors to monitor and record the tension at selected strain points on the gear, and display the data on a bridge monitor. Utilize the electronic gear monitoring equipment including the warp tension meters to indicate the optimum rigging of the gear with regard to catching efficiency. During the project a total of 15 different electronic sensors were employed. Two complete electronic gear monitoring equipment systems were used and the data from each system was monitored on separate computers with a software package which retrieved data from each electronic sensor every 30 seconds (see figure 8). The Global Positioning Satellite System (GPS) was programmed to simultaneously transmit the navigational data into each computer and merge it with the electronic gear data data. Further processing of this data produced on board, and in real time, gave parameters from both nets simultaneously such as Swept Area, Swept Volume, and Distance Towed. Two electronic calipers complemented by software, allowed simultaneous carapace length or girth entries from two operators into one computer. As grids were used on both trawls, no fish measurements were made during the project. This data was also processed on board on a designated computer in real time and made it possible to generate frequency graphs, selectivity curves, and data plots. This valuable feature served to accelerate the decision process in the event of a problem. When the camera was observing the bycatch grid, it was clearly seen that shrimps were being segregated from fish bycatch. What was also obvious was the build up on the grid of species such as skate and flatfish. When this happened it reduced considerably the working surface area of the grid. A strong case was established for reducing the towing speed periodically, to release skate and other flatfish species. When observing the grader grid, the camera confirmed that only a very small quantity of shrimps were passing through the 10 mm grid spaces. Shrimps were starting to block the grid, and eventually a total blockage occurred preventing access to the codend. The video tape from each tow was played back on a large television monitor, this enabled closer observations of fish and gear behaviour. The captain and crew also viewed this material and gave their comments, and necessary adjustments were made prior to shooting. The Neomi Karen's single trawl was a Crimond Model 1110 mesh Labrador Shrimp Trawl. (3 bridle) The Twin trawls were two Crimond Model 938 mesh Labrador Shrimp Trawls (2 bridle). 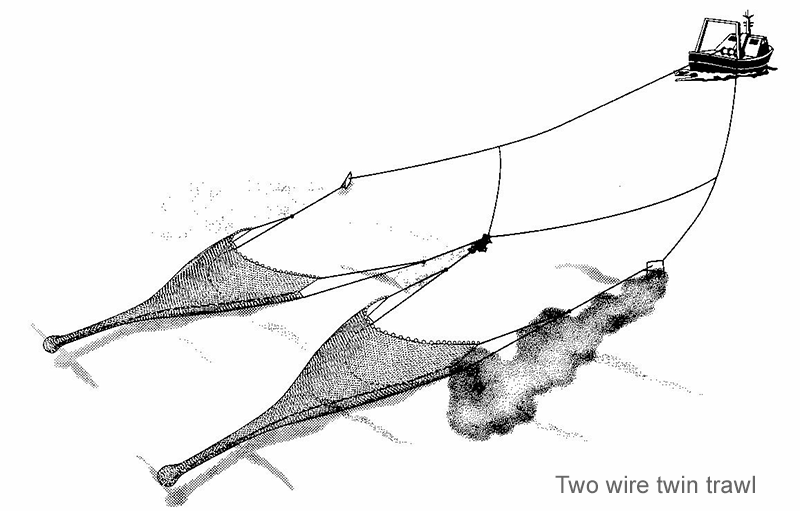 The twin trawls were constructed with a composition of nylon with polythene guard meshes, and the top wings, square, and top bellies, were constructed with Dyneema. The netting was hung on stainless steel combination. The headline was fitted with 120 x 8" floats and the bridles were 20 fathoms long. Both trawls were fitted with selectivity grids, and an additional shrimp grading grid was evaluated during the project. 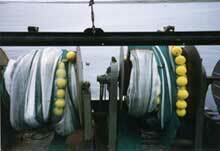 To ensure uniformity, both trawls were mounted at identical ratios and on similar rope lengths. They were also the same overall length and all tapered sections were identical on each trawl. The shrimp grading assembly was installed behind the by catch grid. Both grids were manufactured from plastic. The bycatch grid was installed at an angle of 40 degrees and the bar spaces were 25 mm. The grader grid was installed at an angle of 30 degrees, and the bar spaces were 10 mm. A small mesh bag to retrieve the graded shrimp covered the escape hole at the bottom of the grader grid. On one haul after towing several hours the grader grid angle reduced to 25. Since the method was only using two warps, no changes were required to the winches. The gear was rigged by dividing the warps 94 fathoms forward of the trawl doors and running two 94 fathom splits (port and starboard) to the central clump. The two inner bridles from the trawls were attached to the clump, and the two outer bridles were attached to an extension chain coming from the double door backstraps. The warps and the spreaders were all marked 10 fathoms out from the vessel to indicate the proximity of the gear when heaving up. Inner and outer bridles were colour coded to ensure positive identification by the crew in the initial stages of the trials. Swivels, G-links, and pennants were rigged on the gear where necessary, and all chain used was 5/8" midlink. To facilitate shooting and hauling the gear and prevent jamming in the running blocks, wherever possible hand splices were used on bridles and warps. This reduced the amount of hardware passing through the blocks. It is difficult to calculate how much variation there should be between the centre and the outer two sides, and this is usually found by trial and error. It cannot be readily worked out mathematically because the trawl warps are not straight but are curved, especially with warp lengths as long as 400 fathoms. This problem is compounded by the fact that the two spreader wires connected to the main warps also cause distortion. Practical experience has shown that with a given warp length, the centre wire should normally be a variable distance shorter than the outer wires, to tow the two trawls symmetrically. This was achieved by inserting the difference in the warp in front of the doors. Lengths of 6 feet, 9 feet, and finally 3 feet were tried. When the vessel was ready to commence fishing trials, the project supervisor and a gear/electronic technologist joined the vessel and installed the necessary equipment prior to the sea trials. Fishing gear geometry data was obtained by Crimond using electronic gear monitoring equipment from a successful shrimp vessel the Jean Colette of Caraquet, New Brunswick. This vessel fished with a 938 shrimp trawl and Bison #9 trawl doors. This data was replicated during the trials. To achieve this the twin trawl doors were 51% larger in surface area, going from Bison #9 (S.A. 28.5 sq. ft.) single trawl to #11++ (S.A. 43 sq. ft.) twin trawls. It was also necessary to reduce each doors weight by 181 kg (400 lb.). Fishing in 160 to 170 fathoms is comparatively new in twin trawling. The majority of fishing in the North Sea is conducted in less than 80 fathoms. The trawl designs with high openings, and the heavy footgear used in the project, were also in excess of that used in European midshore twin trawl fisheries. The project was conducted over two seven day periods. Two days were spent installing and testing the electronic gear monitoring equipment, the GPS, and computer based data management systems. The warps, bridles, split bridles, backstraps, trawls, and all towing chains, were measured and checked on the wharf prior to installation on board. The gear was then tested by performing a series of short tows on inshore grounds prior to steaming to commercial fishing grounds in 4Ss and 4Xs near Anticosti Island. Electronic sensors relayed pertinent information and a close watch was kept on the condition of each trawl. Changing towing course and turning with the gear was also repeated, the idea of the twin trawl gear being prone to foul ups during turning maneuvers was soon dispelled, and the Captain found that he could handle the rig as easily as a single trawl system. Speed ranges were from 1.9 to 2.7 knots. The warp and split bridle lengths were set up equal at the door towing points and the centre weight clump were in line, then tested first with 6 feet and 9 feet extensions in front of the doors. From the data recorded 3 feet was a more suitable setback to keep the trawls level. The amount of extension or setback required varies with the depth, and the design and configuration of the gear, and can only be determined by practical experience resulting from trial and error. If the setback is insufficient, then the result is that the inner wings of the trawls become slack, resulting in the build up of meshed fish and debris in that area. If too great a setback is added then the opposite applies, the meshing occurs in the outer wings of the trawls. Severe wing damage may result if this problem is not corrected. The electronic gear monitoring equipment proved invaluable in determining the gear parameters, and the trawls were fishing successfully and equally after only 10 tows. During these preliminary tows all the weights were gradually removed from the doors and the towing point was lowered. The clump weight was increased from 850 lb to 1000 lb, and positive polish marks appeared. Setback length was finalized at 3 feet, and engine RPM was established between 1100 and 1200, depending on the wind and tidal conditions. The Captain commented that the tides were the strongest he had experienced all year, the other Quebec Captains in the area were also complaining about the extremely strong tides which were affecting gear behaviour. The main problem was the tides were running crosswise to the towing ground, this situation was further aggravated by moderate to strong winds. There were at times another eight vessels in the vicinity with no gear monitors, who saw their fishing performance reduced, but could not see the reason why. With the electronic gear monitoring equipment we could see the detrimental affects of the wind and tide on our gear, and take action. On tow #4 different warp lengths were tried and the height of the splits from the bottom was monitored. At first 300 fathoms of warp, giving a scope ratio of 2 to 1 was tried. The gear was not stable, and the depth sensor at the splits indicated 67 fathoms off the bottom. When warp length was 350 fathoms, the splits were 49 fathoms from the bottom. At 400 fathoms out the splits were 32 fathoms from the bottom. Scope of the warp was finally determined as 2.5 = 1, this included the length of the splits. (94 fathoms). This was where the gear stabilized and on further tests the depth of the splits from the bottom remained constant at 28 fathoms. The spread at the splits was measured in an attempt to find a 50% comparison with the doorspread. The distances indicated 116 feet to 257 feet, and 115 feet to 275 feet, we never obtained exactly 50%. The inability to obtain numbers that would have been geometrically correct did not seem to inhibit the efficiency of the gear. Distance between the trawls was constant at 80 feet. On tow #9 all the weights were removed from the doors and the engine speed was reduced from 1150 RPM to 1100 RPM. On tow #10 another 150 lb was added to the clump bringing the total weight to 1000 lb, and the splits went down to 27 fathoms off the bottom. On finalizing the gear geometry, clump weight, towing speed, and warp to depth scope, the next stage was to gather data on tensions throughout the gear. Tension sensors were calibrated to 10 kg prior to shooting. Collating data on tension commenced on tow #10 and during this procedure all tows were made on a straight course. Data was gathered over a 35 hour towing period. While conducting sea trials on the fishing grounds, checks were made on the uniform efficiency of both trawls. This involved the separation and weighing of the catch of the two trawls and recording the amounts. An indication was gained of equal trawl performance, and this information was also used to evaluate comparison fishing with other vessels. Checking the 14 valid tows on Phase 1 revealed an imbalance of .01% between the catching performance of the two trawls. Shortly after shooting on tow number 22 we hooked an obstacle. The Starboard trawl came back minus a lower wing, and part of the first top belly was torn away. Having determined that both trawls had similar geometry and tensions, it was considered appropriate to commence selectivity trials. On trip #2 the grader grid was tested on 5 tows with a total towing time of approximately 22 hours. Trawl Speed and Cross Current or skew was also observed at the headline, and Grid Angle/Flow were also measured on both grids. Using the triple combination of a Speed/Symmetry Sensor on the Headline, and an Angle/Flow sensor on each grid, it was possible to observe important flow data simultaneously from three strategic points in the trawl. During Tow #5 the speed/symmetry sensor on the headline recorded 2.7 knots and a crosstrack of 0.2 knots. The Angle/Flow sensor placed on the first bycatch grid gave a flow indication of 1.5 knots and an angle of 38 degrees.. Finally the Angle/Flow sensor on the grader grid only recorded 0.1 knots and an angle of 32 degrees, which indicated a drastic flow reduction in this area. Observing the Trawl speed or Symmetry sensor during towing, it was seen that when we altered course the trawl speed increased from 2.6 knots to 3.2 knots. The crosstrack or skew indicator moved from 0.0 to 0.9 during the same maneuver. We deliberately induced alterations by changing course and the results were seen on the Symmetry sensor. It may be possible to steer the gear onto 0.0 on the skew indicator but we did not have enough time to experiment. There is no doubt that the trawl speed reduced to the original reading and the crosstrack returned to 0.0 or 0.1 when the gear squared off. Both parameters increased when we altered course. It must be remembered that these tests were made with gear that was in fishing trim. There is a definite relationship between the functions of the Symmetry sensor, and gear distortion. Sampling procedure was done by randomly taking a minimum of 200 specimens from the experimental and the control codend contents. The samples were measured using two electronic calipers directly linked to a computer with custom software. Data was processed and analyzed in real time onboard, allowing immediate action in the event of problems. During all 5 tows with the grader grid the starboard trawl with the grader attached showed consistently less shrimp than the port trawl. On one or two tows, it was seen during hauling that the grader grid had still a good number of shrimps blocking the grid spaces. The starboard trawl opening also showed a reduction of 1 to 1.5 feet from that of the port trawl. After tow number four, length frequencies were taken of two hundred shrimp along with the girth of each of these shrimp. From the graph it can be seen that very few shrimp below 10 mm girth were encountered on the Anticosti grounds. For the shrimp to pass freely through the 10 mm bar spaces we assume a girth of approximately 9 mm. The length frequency graphs in figures 14 & 15 show only nine shrimp were found to be 9 mm or below in girth, in the sample this would correspond to an approximate carapace length of 19 mm and less. Combined with the fact that the animal would have to approach the grid in a longitudinal direction to pass through the bar spaces, lessens the likelihood of all shrimp below 19 mm carapace length escaping through a 10 mm space. Five tows were made with the 10 mm spacing grader grid. The escape hole at the bottom of the grader grid was covered with a small mesh bag to retain any juvenile escapes through the grid. It soon became obvious that compared to catch volumes, very few escapes were occurring, the most shrimps retained in the small mesh bag were 4 lb. to 6 lb., these shrimps could not be measured with the calipers as they were too soft, although it was observed they were in the smaller range class. Catch volumes from the 5 tows performed during the grader grid tests were 21,000 lbs in total. The underwater camera confirmed that no shrimp were escaping through the grader grid. Further onboard computer analysis on the physical length, and girth, of the smallest shrimps available in the biomass, suggested that juvenile shrimps which would pass through a grader grid with 10 mm bar spaces, were not available to the gear. On tow #4 we caught nearly 10,000 lb and most of the catch in the starboard trawl was blocked in front of the grader grid. We must assume that the presence of the grader grid contributed to the blockage. This could have resulted in losing the catch of the starboard trawl due to the distortion caused in the extension. The angle of the grader grid did decrease substantially, probably due to the weight of shrimps in the codend. After discussion with the captain, and bearing in mind we did not have a grid with larger spaces on board, it was decided to discontinue this experiment. On further talks with the captain it was learned that the shrimp in this area off Anticosti were of a larger length class than that off Newfoundland, where a similar grid spacing had yielded more encouraging results. Both trawls were shot from a single netdrum which was split with a centre flange. After the trawls were paid out, the bridles followed until the four netdrum pennants were reached (one pennant for each set of bridles). The bridles were then attached to the door and clump backstraps, and disconnected from the netdrum pennants. It is at this point that it is important to identify the inner and outer bridles hence the significance of special marks or colour coding them. A final check is made to determine that both the grids, floats, etc. are clear and there are no twists in the gear. The spreaders are then connected to the clump and with the vessel going slow ahead the clump is slipped then doors are lowered beneath the water. Some problems may be encountered shooting if the clump has excessive strain, this causes the doors to become unstable. With the vessel steaming slow ahead the gear is hove back to the point of the warp where the spreader wires join, the winches are stopped and any turns are removed. A mark was placed on the main warps 10 fathoms from the doors, and at a similar distance on the spreaders. When hauling, the 94 fathom spreader wires were stowed on the main winch. The vessel kept slow ahead to stream the gear out and avoid fouling the propeller. The winches were then restarted until the clump came to the vessel (ahead of the doors). The clump was secured using a quick release hook, the spreaders were disconnected from the clump then the doors were hove up, all pennants from the door backstraps and behind the clump were then connected to the netdrum messengers, then the bridles and trawls were hove onto the netdrum. Fundamentally the two wire system works and has its advantages when conducting selectivity experiments, but in many cases reports indicate that the three wire system has more attributes and is more efficient in a commercial environment. Unsubstantiated reports from Europe indicate that the two wire system may be better for deep water. The depth of water in which New Brunswick shrimp trawlers conduct shrimp fishing is termed deep water. The two winches may also require more power and an increased holding capacity. Towing blocks and deck blocks must be large enough to accommodate the increase in the number of G-links and recessed links, swivels and shackles. It is essential that the netdrum be modified to accommodate two trawls in two sections on a common shaft, or in the best scenario, two separate netdrums. Careful attention must be paid in observing whether the clump chains have been polished, and to what extent. One advantage of twin trawling is that any anomalies in the gear show up in the fishing performance of the two trawls. If one trawl consistently outperforms the other, this is a sure indication that something is wrong. To eliminate the problem, it is good procedure to exchange the trawls, and if the problem persists, then the bridles and warps must be measured. If the setback is too much the outer wings tend to bag and collect meshed fish and debris. Subsequently if the setback is not enough, the inner wings act in the same manner. Fortunately during the project, the setback was determined quickly with the electronic gear monitoring equipment. Meshing was even, and ongoing checks with the contents of each trawl confirmed equality between the trawls. Determining the correct setback is a major obstacle to obtaining the correct gear geometry, and is directly related to several factors, including diameter and length of warps, depth of water, and clump weight. In general, shooting and hauling the two trawls was uncomplicated, although it would have been easier with two independent split netdrums. Twists in the grids were difficult to remove, as a result of the netdrum being too high for crewmen to trace the lestriges as the trawls were being shot. On two occasions twists occurred in the grids when turning manoeuvres were performed prior to shooting the doors. Turning and maneuvering are slower than that of the single trawl. It may be better to turn quickly and collapse the gear, and then square it on the new towing course. Taking the warps to a central towing point may also help solve this problem. One day the wind was NW force 7 to 8 with a heavy swell and the fishing reports from the other vessels in the vicinity were poor. The captain thought that the twin trawl gear was fishing better in bad weather than his single trawl. This could be possible as the actual towing points of the gear are not at the vessel, but 28 fathoms from the bottom, creating more stability, and detaching the gear from the vessel motions in a seaway. Another benefit is, that if one trawl is foul or severely damaged then it must be assumed that only half the catch is lost, compared with the total catch when towing one trawl. Extra efficient swivels should be inserted at the split wires, as this area was prone to twisting. Attempting to remove twists using a bar proved futile, as there was too much backstrain.